Since 2001, MB has offered the largest line of patented crusher buckets all over the world. With extensive innovation and development, MB now offers crusher buckets for excavators, skid loaders, and backhoes of all sizes. 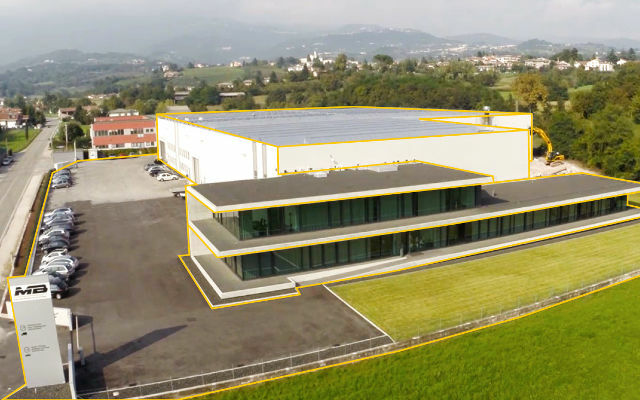 The values of the family owned business have enabled MB to reach levels of internationally recognized excellence: founded and headquartered in Italy, the company establishes itself globally through 7 international subsidiaries with logistic centers located on different continents, as well as an extensive network of authorized dealers and service support throughout the world. The biggest advantage at MB is the quality of its organization. Inside the new MB Headquarters, with a total area of over 180,000 square feet, MB manages all phases, from research and development to production to sales. The company controls the complete supply chain to ensure the products are of the highest “Made in Italy” quality. MB always looks forward to the future through the development of new tools and accessories to satisfy customers’ needs. MB prides itself in its expertise in the crushing field. With more than 60 years of crushing experience in the excavation, road work, quarry, and demolition sectors, the Azzolin family had a vision of a crusher applicable to excavators. With the flexibility and mobility of an accessory and the performance of a larger machine, they wanted to replace the traditional crusher in most applications. It was this vision that resulted in the first worldwide patented crushing bucket. MB strives for customer satisfaction and is dedicated to provide 24 hour support to ensure complete service, every step of the way. For this reason, MB has been awarded and recognized for its products and global sales results. MB takes pride in being the best-selling crushebucket in the world with over 90% market share. Designed and manufactured in Italy, only the best materials are used to obtain the highest quality. Solid, durable and characterized by the now recognizable clean lines designed to resist wear and high stresses in the toughest working conditions.